Will Proposed Wall Along Turkish-Iranian Border Keep Out Kurdish Separatists? Ankara's apparent intention to build a wall along its border with Iran is being met with skepticism by some regional experts who question its practicality and whether it will curb cross-border terrorism as Turkey intends. A report last week in the Hurriyet Daily News, written by a reporter close to the Turkish government, quoted unnamed Turkish authorities as saying the wall is necessary to keep out militants in Iran associated with the outlawed Kurdistan Workers Party (PKK), which is fighting the Turkish State for greater autonomy. "The PKK has a lot of camps on Iranian territory along the border with Turkey," the newspaper quoted a government source as saying. "These camps house between 800 and 1,000 Kurdish fighters. They cross the border, commit attacks in Turkey and run back. "As a precaution against this, we are going to build a wall along 70 kilometers of the border near Agrı and Igdır, and we will close the rest of it with towers and iron fences," the official said. The wall proposal copies what Turkey has done along its Syrian border since 2014. Turkey put up concrete barriers topped with razor wire along about 900 kilometers of its border with Syria at a cost of $672 million. The enhanced border security is designed to keep out Islamic State infiltrators and forces associated with PKK in Syria. Tehran reacted positively to the Turkish proposal along the Iranian border, according to Iranian state-run media. 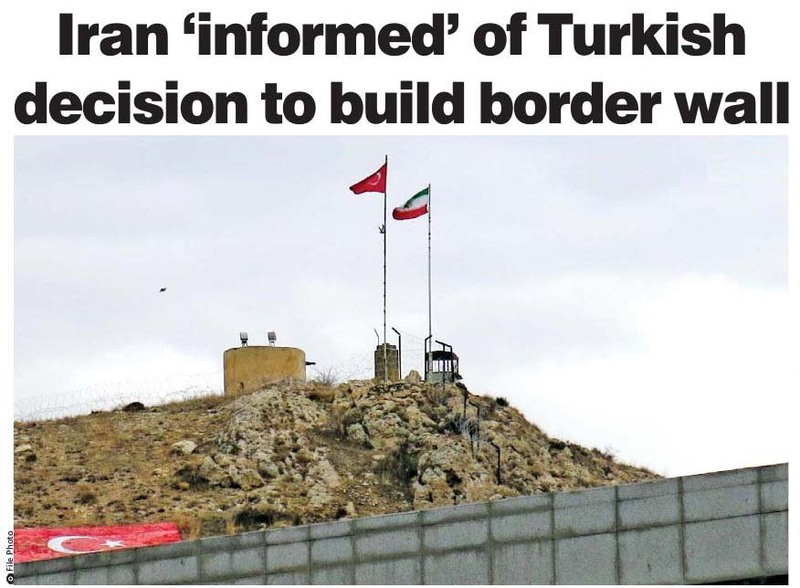 "We are not principally against Turkey's project to build a wall on the Iranian border," an Iranian Foreign Ministry official told the Tehran Times. "Yet every action that takes place on the border should be reported to Tehran." Tehran hopes a wall will alleviate the smuggling of clothing and other goods from Iran, an illicit trade Tehran says is worth $2 billion annually. "We even encourage this should happen sooner and the flow of contraband to Iran should be curbed," an Iranian government source told Tehran's IRNA news. But some experts say walling and fencing Turkey's border with Iran, which stretches more than 500 kilometers, is impractical. "Considering the fact that most of this borderline is inaccessible, mountainous and in high altitude, building such a wall all along the border is neither possible nor rational," said Savas Bicer, a retired Turkish Army colonel with expertise in Turkey-Iran border affairs. And as for curbing cross-border activities of the PKK, Rebwar Karim Mahmood, an Kurdish Iraqi international affairs expert, said the PKK is skilled at getting insurgent help from across Turkey's borders in Iran, Syria and Iraq. "Building a wall on some parts of the border with Iran cannot prevent PKK who know the border and its passages like the back of their hand from conducting operations or passing into Turkey," he said. But Turkish analyst Hakki Uygur, who runs the Center for Iranian Studies in Ankara, cities what the Turkish government calls a success in the barriers with Syria. A Turkish military colonel told Reuters recently that smuggling attempt numbers, which peaked in 2014 at 3,474 incidents, dropped to 77 in 2016. Illegal crossing attempts fell to 8,531 from more than 12,000 over the same period, Reuters reported. "We can surely say that such a wall can prevent PKK and other hostile groups from moving and conducting operations in Turkey at some points if not completely," Uygur said of the Turkish-Iran border proposal. Turkey has long blamed Iran for providing safe harbor for PKK affiliates inside its territory and accuses the Iranian regime of turning a blind eye to PKK activities. The Iranian border town of Maku is known by locals as a hub for PKK activity with much of it centered in a mosque in one district. "They [PKK] hold meetings, recruit and even fundraise in that mosque built by a notorious local smuggler - all under the nose of Iranian security forces," Ahmed Najmuddin a Maku resident told VOA.